Rising Tide Capital, a 501(c)(3) nonprofit that works to transform communities and lives through entrepreneurship, was one of only three organizations highlighted in The Maker City Project Policy Guide, “How to Revitalize Your City Or Town,” which is designed to assist local policymakers and community-focused residents in understanding new innovation models for economic revitalization. Rising Tide Capital was featured because of its success in helping economically disadvantaged entrepreneurs to start, grow, and sustain businesses in a way that also positively impacts their communities. The Makers City Project partners with cities, corporations, and nonprofits to encourage cities and towns to ready themselves for technology change and its effects on the future of work. “We thrilled to be profiled in this guide, which showcases the most effective ways that communities can build a thriving local economy through an ecosystem approach. Our approach is to leverage entrepreneurship as a stepping stone into the middle class for people who are stuck in entry-level jobs, may not be working at all, or are struggling entrepreneurs. Through our Community Business Academy, we've found that we can train potential entrepreneurs in the practical skills they need in as little as 12 weeks. We also offer extensive ongoing support to our graduates through mentorship, coaching, and access to financing and procurement opportunities. We’ve found that access to continued technical and promotional support and belonging to the community of entrepreneurs that we have cultivated are often the difference between success and failure,” explained Alfa Demmellash, co-founder and CEO of Rising Tide Capital. The Policy Guide & Checklist were officially presented at the invitation-only 2017 BALLE Leadership Conference, an annual conference that focuses on the process of building healthy, equitable local economies across North America. As a part of this recognition, Alfa Demmellash, Rising Tide Capital co-founder and CEO is serving as a speaker at the conference, which is currently underway. The Policy Guide & Checklist details five different models that cities and towns can use to revitalize their communities in an inclusive way. Alongside Rising Tide Capital, Innovation Collective (Idaho, Montana, California) and Hope Street Group (National with reach into 16 states) are also profiled. Each innovation partner that is featured has a different theory of change and a different methodology and process. Each works to help a city or town that is 'stuck' get 'unstuck' when it comes to responding to deindustrialization. RTC is headquartered in Jersey City, New Jersey with offices in Newark and Orange. The organization is also in the South Side of Chicago through a replication partnership with a local non-profit. RTC has four primary programs: the Community Business Academy, the Start Something Challenge, Credit to Capital, and Business Acceleration Services. All of these programs are aimed at helping entrepreneurs to achieve self-sufficiency, thrive, and deliver value to their communities. RTC’s model is unique in that it offers ongoing mentoring and support to ensure sustainability. RTC’s work has been recognized by CNN, the World Economic Forum, and President Obama at the White House. About the Maker City Project, Inc. 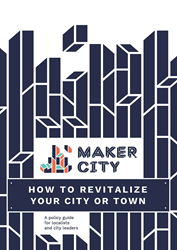 The Maker City Project partners with cities, corporations, and nonprofits to encourage cities and towns to ready themselves for technology change and its effects on the future of work and to become a Maker City. We encourage localism to flourish by bringing stories, methodologies, and examples that have worked in one community to other communities looking to revitalize themselves. Much of our work is cross sector, cutting across the public, private, and nonprofit sectors, and includes working with both cities in the U.S. and internationally. Partners organizations include the Ewing Marion Kauffman Foundation, Maker Media, McClatchy Corporation, SFMade, Urban Manufacturing Alliance, USC Annenberg Center on Communications Leadership & Policy, and U.S. News and World Report. The Maker City Policy Brief--a Policy Guide for Localists and City LeadersThe brief titled “How to Revitalize Your City Or Town,” details five different models that cities and towns can use to revitalize their communities in an inclusive way through entrepreneurship, small business development and workforce training. Three innovation partners are profiled in depth including Rising Tide Capital (New Jersey, Illinois), Innovation Collective (Idaho, Montana, California), and Hope Street Group (national with reach into 16 states).